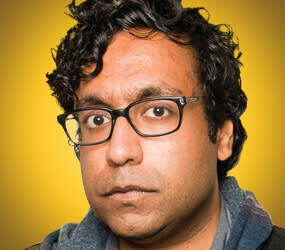 Hari Kondabolu is a comedian, writer & podcaster. Hari recently released his Netflix special Warn Your Relatives and was named one of Variety’s “Top 10 Comics To Watch.” He has released two comedy albums two albums, Waiting for 2042 and Mainstream American Comic, and has his own half-hour special on Comedy Central. Hari is a former writer & correspondent on Totally Biased with W. Kamau Bell and is a regular on the public radio gameshow Wait, Wait Don’t Tell Me.